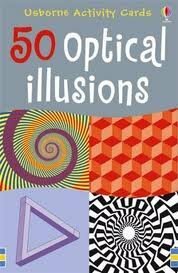 This title includes fifty cards featuring mind-bending illusions to surprise your eyes, taken from the personal collection of Al Seckel, world expert on visual illusions. An optical illusion on each card is accompanied by text on the reverse explaining how the illusion works in tricking the eye. This title comes with a 'revealer' card, which can be used to measure and check the illustrations to increase understanding of how each illusion works.